I serve a downtown church in a small city. The building is brick and situated on a busy main street. We are surrounded by a variety of small business’ and residences. Cars and people pass the church at a steady clip. The invisibility of the familiar is a fitting metaphor for the plight of religious institutions in today’s culture. Yet the same studies show that the majority of those who say that they are ‘not religious’ also self identify as ‘spiritual’. By spiritual people refer to a sense of openness to that which is greater than oneself. A desire to connect to that great Mystery some call God/Creator/Spirit and a desire to find meaning in community. Recently our church started an initiative ‘Can we chalk?’ The idea is to bring the messages of love and encouragement (rooted in our faith) to the wider community. A box of large chalk is at the entrance to the church inviting people to write on the side-walk words of love and encouragement. Gradually the words became bigger, bolder. 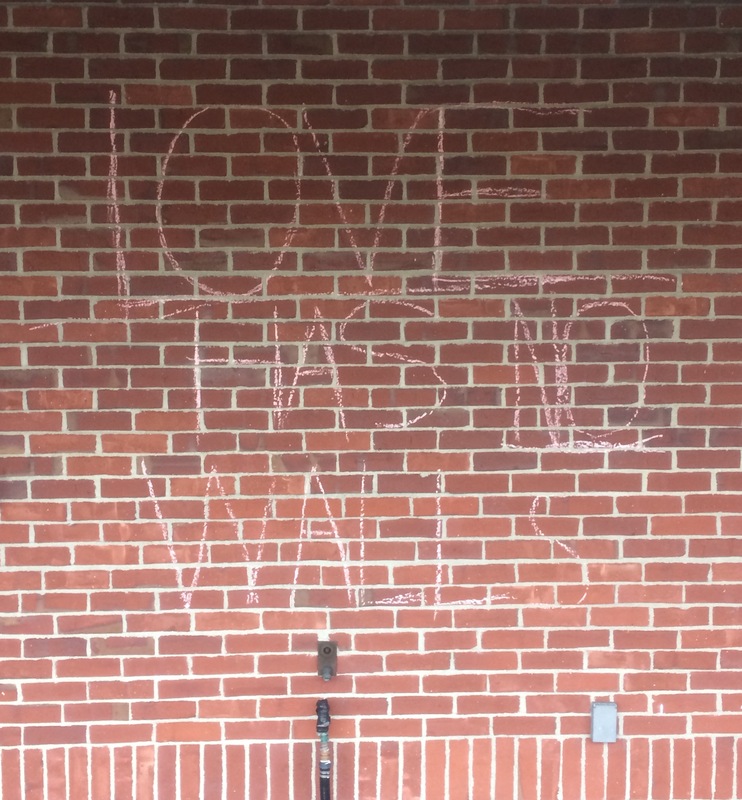 One person wrote: ‘Love Has No Walls’. Surely this is a message for our time. I think of President Trump’s promise to build a wall between Mexico and the USA….Israel’s wall between themselves and the Palestinians…The wall that separated East Berlin from West Berlin during the Cold War. Such walls are ugly and built on fear. Yet, a passerby took up the invitation of the church and offered a message of hope. Then the messages got even bigger. 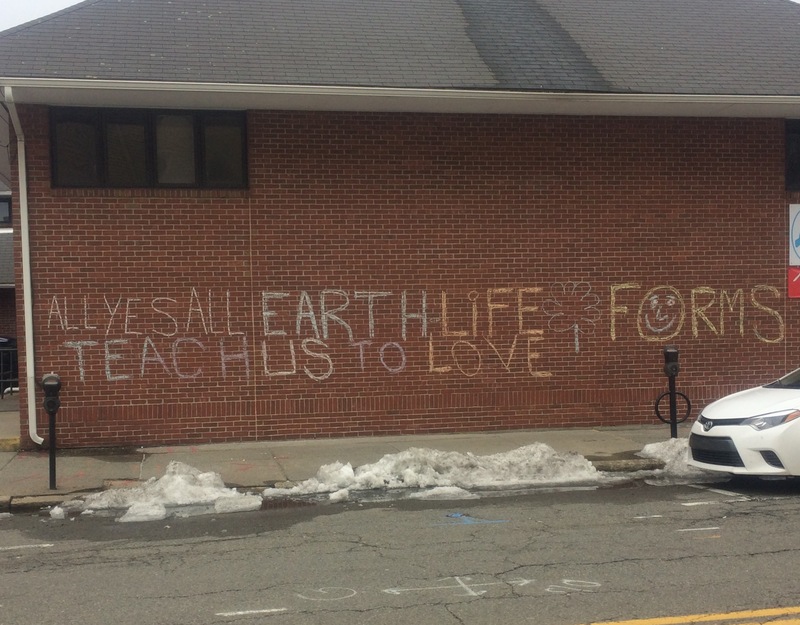 A homeless neighbor took it upon himself to create a large mural offering words of love and support. Such expressions haven’t been appreciated by everyone. For some drawing upon the church building is unseemly. A distraction from the simple beauty of the building. Nothing more than graffiti. I think there is an element of discomfort with losing control of our message. We invited church members and neighbors to take us up on an offer to spread messages of love on the sidewalk and they did. 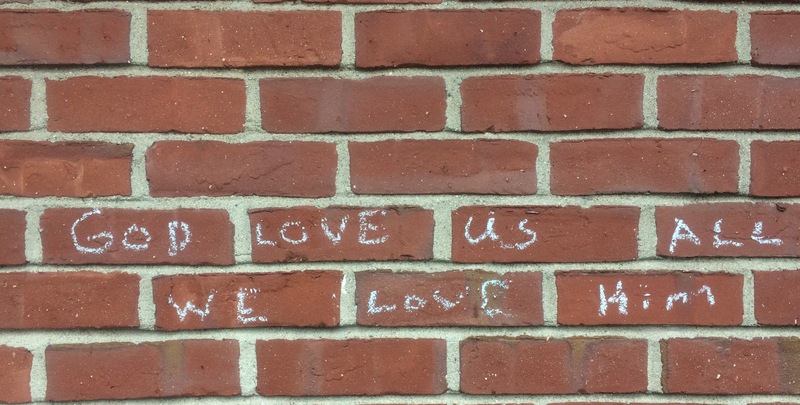 But then the messages morphed onto our walls. We didn’t expect that. Our space has become unpredictable. We are no longer invisible. Each day people stop to read the messages. Some take photos. We’ve initiated conversation in the wider community. ‘Can We Chalk?’ as a public art project was not intended to be permanent. Soon the side-walk art will be washed away by rain and eventually the walls will be cleaned too. But I hope we as a church take away an important lesson. A lesson taught by the early Church in the Book of Acts in the first century. That the church of Jesus Christ is not intended to be contained or constrained by bricks and mortar. The church is to be a living, breathing community that goes out into the community to offer healing, hope and love. To listen and learn. To build bridges not put up walls. Loving in such a way is unpredictable. Love takes us from the comfort of what is familiar and brings us to a new level of intimacy and engagement with our community. In doing so we find that we are no longer invisible. This is Good News.